How do you go forward when your world says you have brought hope, but your lightning rod is missing? This is the question Wally West raises in Heroes in Crisis #6 as he works through his trauma of returning to a world where his wife and kids do not exist. Where many of his friends remember him and the hope his return brings, he is empty inside. The mystery deepens as to who has taken the Sanctuary for healing, into a web of murderous destruction. The psyche of many heroes and villains is explored in looking at what is holding them back from being whole. It opens with questions around how many lives saved. Reflect on that, how does one judge a heroic life? How do you judge your own success in life? Is it through numbers, money, things, people? What spells out success for you? 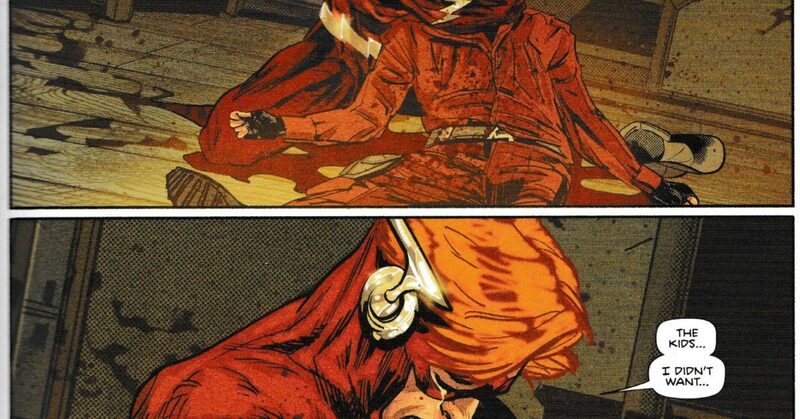 It is through this line of questioning that the character of Roy Harper (Speedy/Arsenal/Red Arrow) emerges. The former young sidekick of Green Arrow; former heroin addict, single dad, former member of the Outlaws and Teen Titans. He is at Sanctuary working through his stuff, when this questions arises. 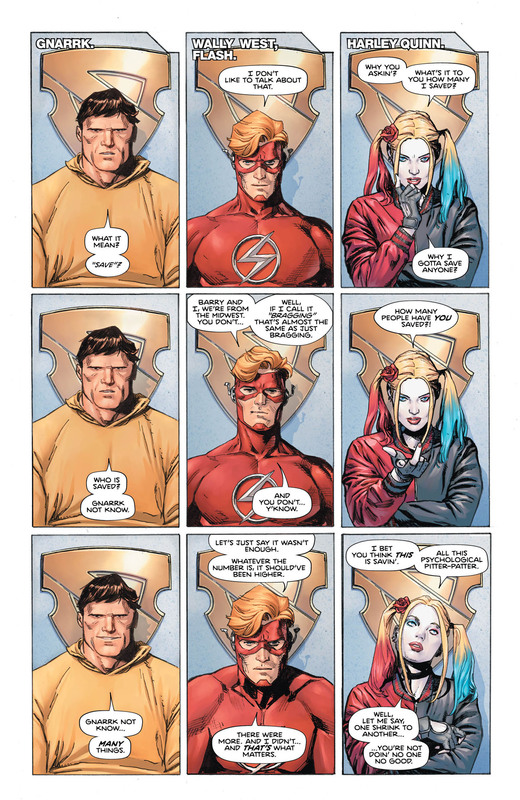 The Heroes in Crisis mini series has been excellent. Well paced with the super hero action, and the crime mystery noir feel of mystery to it. Who invaded Sanctuary? Who did the spree killing? Who removed the safe space for heroes to heal? These are the underlying questions. But then the questions erupt even more as the mysterious Puddler has leaked the story to the media of Sanctuary. Lois Lane can only sit on the story for so long, and as issue 4 came to a close, it was revealed the story was going out. This is the opening to issue 5. As Booster Gold and Harley Quinn, partnered with Blue Beetle and Bat-girl respectively seek out answers. Flash and Batman deep dive into this weird mystery. Superman and Wonder Woman address the press. It is a timely tale within the week of Belle’s Let’s Talk, a social media initiative to remove stigma of mental health. It reveals that there is much more needed than simply social media awareness raising. It is a concerted effort by governments around the world to appropriately fund mental health care equally, and as part of universal health care. It is understanding what is happening, that it is shifting how one experiences the world. It takes courage to live differently, but it also takes courage to understand when one needs help, to seek that help out and to heal. Will you live in fear of the unknown, or know that by someone opening up they will discover whey they are under the scars, and discover love of life once more.